Indeed, Putin has helped his friends a great deal. According to Forbes, many of them are billionaires, even without counting what they probably have stashed away in offshore havens. For example, the leaked “Panama Papers” last year revealed that Putin’s childhood friend Sergey Roldugin – a cellist who does not even pretend to be a businessman – has received some $2 billion in state funds. Unlike their fathers, most of these oligarchs-in-waiting have no graduate training. After college, they tend to go straight into career jobs at state-owned banks or companies such as Gazprom, where, after one or two quick promotions, they usually become a vice president. Their sisters, meanwhile, are supposed to marry suitable young men. Among Putin’s golden youth, the sons of his St. Petersburg cronies have done particularly well, usually by working in privatized companies. Consider the case of the lesser-known Putin crony Nikolai Shamalov and his two sons. Shamalov managed medical-equipment sales in Russia for Siemens AG until 2008, when the United States Department of Justice and the US Securities and Exchange Commission fined Siemens $1.34 billion for violating the Foreign Corrupt Practices Act. According to the SEC, Siemens had engaged “in a systematic practice of paying bribes to foreign government officials to obtain business” in six countries, including Russia. Shamalov was sacked from Siemens after 16 years of loyal service. But he landed softly, and his two sons have already had splendid careers. In 2005, his older son, Yuri, became the chief executive of Gazfond, Gazprom’s large pension fund. And, his younger son, Kirill, became – at the age of 25 – a vice president at Sibur, a large petrochemical company that had been spun off from Gazprom. From 2011 to 2013, Kirill acquired 4.3% of Sibur through an executive stock-option program. Then, in 2013, he reportedly married Putin’s daughter, Katerina Tikhonova, in a secret ceremony, after which Putin’s wealthiest crony, Gennady Timchenko, sold him 17% of Sibur at a favorable price. All told, Putin’s son-in-law was worth an estimated $1.3 billion by the time he was 34. Or consider the case of Arkady Rotenberg, an oligarch who has thrived on state contracts for gas pipelines and roads. Rotenberg’s oldest son, Igor, is the majority shareholder in Gazprom Drilling; his second son, Roman, is a vice president at Gazprombank. Similarly, the son of Yuri Kovalchuk – the spider in Putin’s financial web who runs Bank Rossiya, which is under international sanctions – is the CEO of Inter RAO, a state-owned energy holding company. The sons of Putin’s KGB friends have also ascended quickly in the corporate world. Sergei Ivanov, the namesake of Putin’s former chief of staff, first became a vice president of Gazprombank at age 25, and then the president of Alrosa, Russia’s state-owned diamond company, at 36. Russian National Security Adviser Nikolay Patrushev’s son, Dmitry, became CEO of Rosselkhozbank, the state-owned Russian Agricultural Bank, at 33. And Rosneft CEO Igor Sechin’s son, Ivan, became deputy director of a Rosneft department at 25. In this context, FSB Chairman Aleksandr Bortnikov’s son, Denis, was a wise old man of 37 when he joined the VTB Bank management board. Russian Prime Minister and SVR Director Mikhail Fradkov’s son, Petr, was more in the generational mold, just 29 when he became a deputy chairman of Vnesheconombank – the bank now associated with the Trump administration’s ongoing scandals. Putin’s loyalty to his cronies and their families seems to know no bounds. In November 2015, his government introduced a new road tax called “Platon,” and faced large-scale protests among independent long-haul truckers, just so that it could create a monopoly for an operating company that is half-owned by Igor Rotenberg. Putin even defended Platon at his annual press conference in December 2015. When a questioner brought up “Rotenberg, Jr., who has received the country’s long-haul truckers as a present,” Putin brushed off her concerns as being “of secondary importance.” According to Putin, revenues from the tax “do not go into somebody’s pocket but into the Road Fund of the Russian Federation, down to the last cent.” And from there, he claimed, it “is spent on road construction in Russian regions.” But, despite Putin’s reassurances, massive protests have continued, and so has the flow of money into Igor Rotenberg’s pocket. While nepotism is rampant in Russia, the concentration of such a tiny group of wealthy individuals in top positions is striking. 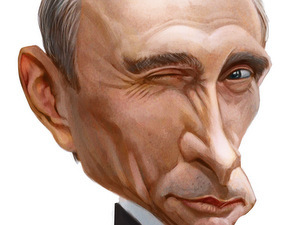 Putin’s intergenerational cronyism has made the oligarchs and their families ever wealthier. But with fewer and fewer career paths to top positions, resentment among a generation of young, able, and ambitious Russians will only continue to fester. Anders Åslund is a senior fellow at the Atlantic Council in Washington, DC, and a longtime student of the Russian economy.